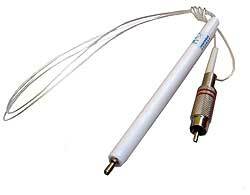 Point Probe for Denas new (2010), DENAS+, DiaDens-T, DiaDena-PC, DiaDens-PCM devices. Electrode designed for accessing small zones and acupuncture pints on the body and on the ear (auricular points). Note, this point probe included to complete set of DiaDENS-T, DiaDENS-DT, DiaDENS-PC devices. Attention: Denas device requires special adapter to hook up this electrode.